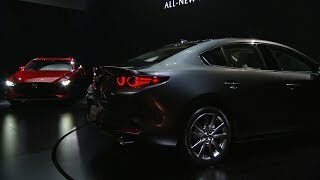 HIROSHIMA, Japan—Mazda Motor Corporation today hosted the world premiere of the all-new Mazda3. The fully redesigned model will be rolled out to global markets starting from North America in early 2019. The all-new Mazda3 will be on display at the Los Angeles Auto Show, open to the public from Nov. 30 through Dec. 9. Our goal at Mazda is to achieve Mazda Premium. That means gaining customers’ trust and becoming an essential part of their lives by pursuing and forever refining the distinctive driving pleasure that is unique to the Mazda brand. The all-new Mazda3 unveiled at this year’s Los Angeles Auto Show will play an important role in raising this driving pleasure to new levels and beginning a new era in which Mazda Premium will become a reality. Every detail in every Mazda is conceived to evoke an emotion. We design and engineer around what cannot be measured. Only experienced. This philosophy has never changed. And it never will. But in the all-new Mazda3, it has evolved. And a new era begins. Don’t miss our all-new Mazda3 unveiling LIVE, November 27th at 7:30 p.m. PST/10:30 p.m. EST. HIROSHIMA, Japan—Mazda Motor Corporation announced today that the all-new Mazda3 will make its world premiere at the Los Angeles Auto Show, open to the public Nov. 30 through Dec. 9. The all-new Mazda3 adopts a more mature interpretation of Kodo design that embodies the essence of Japanese aesthetics. Meanwhile, fundamental performance attributes have been raised to a new level. Next-generation Skyactiv-Vehicle Architecture enables people to make the most of their natural sense of balance and the latest Skyactiv engines offer responsive control of vehicle speed in any driving situation. For additional images, click here.